For children who are ready to take their first independent dance class. Students will experience dance, music and movement through guided creative activities, stories and adventures. We will move like animals and become favorite storybook characters. In each class our bodies will be in motion and we will learn basic ballet positions, steps and even some French terminology. Our carefully planned classes include seasonal themes and songs, and a variety of stories and props. New movements are regularly introduced and previous ones often repeated to allow for individual progression and discovery. Classes are kept small and teen assistants serve as role-models and helpers. Looking for fall 2016 classes? 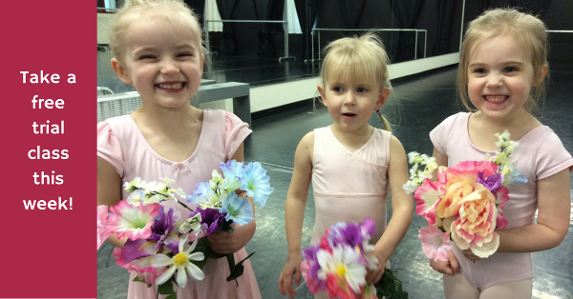 Check out our new Princess Ballerinas program! Make up classes: Have to miss a class due to illness or travel? Make it up at one of our other class times during the same session. She races through the door, her pink ballet slippers shuffling as she joins the circle ready to begin. Once the music starts, her face beams with joy, twirling to the beat as she feels her body stretch and strengthen. You can tell by the way she looks at her teacher that these classes are more than just about learning to dance. Her teacher makes her feel important, encourages her to explore her creativity and week-by-week improves her confidence - not to mention her dancing! You see, helping your child fall in love with dance is only part of what we do at Ballet U. It’s all about creating childhood memories of dance classes you will both cherish for a lifetime. Do you belong to a Mom's Group or Play Group? We'd be happy to design and host a custom class or class series for your group. Please contact Stephanie for more info. Creative Movement classes are offered in three sessions of about 10 weeks each throughout the school year, as well as in two shorter sessions during the summer. Parents are able to watch classes through our observation windows and are invited into the dance studio for the final class in each session. We accept new students at any time, as long as there are openings, and will prorate tuition for classes missed. About your child's teacher: The majority of our children's classes are taught by Ms. Stephanie, who is a patient mother of four, a creative and experienced dance instructor and loves passing on her love of dance to children. Class sizes are kept small (max. 10 students) and manageable with the help of our preteen and teen class assistants. "What should my child wear?" Girls’ uniform package available at Ballet U for $37. Leather ballet slippers only: $15. If you already own dance wear in a different color it's OK to wear that until outgrown. Please do not purchase shoes at any of the big box stores. They are not leather and do not fit well. Contact us to get fitted for dancewear at Ballet U. "Is my child ready for dance class?" 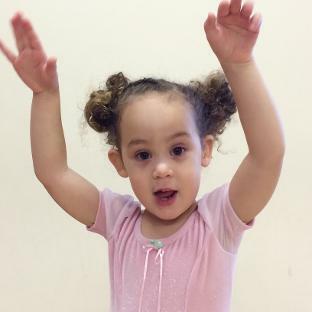 If your child is (almost) three and independent enough to be happy without mom or dad in a classroom setting for a limited period of time, he or she is likely ready and would greatly enjoy our Creative Movement class. Please set up a free trial class to get to know us! "Can I watch my child's class?" Yes! You will get to observe your little one from our adjoining observation hallway which is outfitted with one-way mirrors. For the last class of each session parents are invited into the classroom.